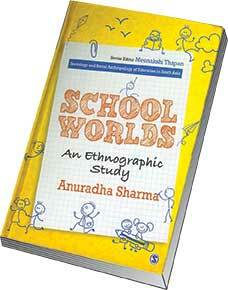 People interested in the field of sociology and social anthropology research in education will find School Worlds by Anuradha Sharma an intriguing read. With a cover having animated pictures of school going children, the book is about the research conducted by the author into the link between education and society in a private co-educational secondary school in Delhi. Dr. Anuradha Sharma has been teaching sociology in the various colleges of the University of Delhi for more than a decade. This book draws inspiration from the extensive ethnographic research work undertaken during the course of her tenure as a professor. A part of the study was published as a chapter in ‘Negotiating School and Gender: Peer Performatives’ in Ethnographies of Schooling in Contemporary India (2014, SAGE Publications) edited by eminent professor Meenakshi Thapan, who is also the senior editor of the book that is being reviewed. The school described in the book is located in an urban neighbourhood and is being run for a charitable cause. There is no particular reason given by the author to choose this school except that it provides an interface between a government run school and a private school. The experiences of students have been analyzed through the lens of class, gender, and religion. These experiences are related to school processes such as classroom interactions, free periods, cultural events, extracurricular activities, lunch breaks, punishments and rewards, etc. It is in this interaction between a student and the school processes that meaning emerges. Class became a significant factor as most of the students were from economically disadvantaged families. The children received all the facilities available in a private school, which otherwise they wouldn’t have experienced due to the economic barrier. How this constructs the attitude of the students, teachers, and parents and the meanings each one of these stakeholders derives is captured in the study. Gender is analyzed not only by how girls and boys see themselves within the four walls of their school but beyond the school, especially family and popular media. Through a series of events, the author tells us, strikingly that gender inequality is absent inside the classrooms, and that in fact it can be observed more in peer interactions and peer perspectives. Religion is selected as the third factor by the author that is examined through the cultural socialization that the children internalize even before they come to school. The use of religious symbols by the school for representational purposes and extracurricular activities has also been considered while studying the presence of religion in the school. One of the crucial elements that the author has stressed on is the work of agency. Agency is the will to initiate a change in the structure to which one is a part. It becomes significant in relation to the structure. The author has maintained a formal style of writing and avoided vague and general statements. She is clear and specific and her arguments are well supported by other research. There is a flow of thought right from introducing the school to the readers till her reflections. There are seven chapters in the book followed by an appendix where a sample questionnaire has been included. Since it is an ethnographic study, observation, informal conversations and formal interviews as techniques have been used and discussed. The location and time of study conducted make it an interesting read as readers will be able to relate to the anecdotes provided by the author. This work does not seek to measure the impact of the school by using some quantitative methods rather it relies on perceptions and activities of its participants that bring out the complexities into play. Caste which is an integral part of everyday lives of people in India is left out from the study. According to Sharma (2016), Caste cannot be devalued as a dimension of social class identity, but its expressions have become less categorical. In the village schools attended by Dalit students, the discriminatory practices associated with purity and pollution are overtly present. Over discrimination through separate seating and serving of food, referring to caste designations, making them sit at the end of the classroom or on the floor remain commonplace in rural schools. In urban schools, such blatant expressions of caste discrimination are not always apparent. The discrimination attitudes of educators have a more powerful social class connotation in urban schools. Caste inequality appears to have metamorphosized into class disparity (p. XVI). Overall, the book opens up a Pandora’s box of issues that are often missed out by the people engaged in the teaching and learning process, especially in a school. It can be used as a great source of reflection by teachers as they work closely with children. Everyday interactions between teachers and students and the perceptions that each one carries, helps in generating notions of identity for the child. The reviewer has been a primary teacher and has just completed her MA in Education from the Azim Premji University, Bengaluru. Her areas of interest include early childhood education and understanding alternative education schooling in India. She can be reached at ankita.shah13@apu.edu.in.